The following is the first segment of fearless eight parts exchange between German Left voice Clara S and ex Israeli Jazz artist Gilad Atzmon. We spoke about Israel, Palestine, the Holocaust, peace and delusion, Left and Right, the meaning of the past and the prospect of a future within the context of the current identitarian dystopia. Clara: What does the Holocaust mean to you? Gilad: This is pretty loaded question. The answer is undoubtedly a multilayered one. Clara: So let’s have a look at the layers and loads in this conversation. How did the Holocaust come into your life? Gilad: I grew up in Israel, I was surrounded by people with tattooed forearms; some of them were members of my family. Clara: So the Holocaust was part of your reality from the day you were born? Gilad: That is hard for me to say although it was clearly there. But I do not think that we, Israelis born in the 1960s, were that concerned about the Holocaust. Both my parents were born in Palestine. On my father’s side, my great great grandfather was buried on Mount Olive. My wife probably sees it differently. Both her parents lived in Europe during the war and suffered a lot. Still the Israeli society in which I grew up looked down on Holocaust survivors. They were seen as weak diaspora characters, people who weren’t quick enough to respond to the Jewish Nationalist call and paid heavily. Clara: Are you really telling me that Israelis had no sympathy for the victims of the Holocaust!? Gilad: I guess that here I happen to be the messenger. Until the late 1960s there was an element of dismissal, repression and concealment of the Holocaust in Israel. But there is more that helps to explain this. In Israel in the 1960s, the 70s and even the 80s I can not remember Holocaust survivors asking for sympathy or even empathy. It seemed to us as if most of them wanted to put the Holocaust behind them. To move on, to forget. I tend to believe, and I am not alone, that it was the so-called 2nd generation that politicised the Holocaust. It was the 2nd generation that made this chapter into a contemporary pillar of Israeli identity. The 2nd generation found it difficult or perhaps impossible to deal with their parents’ plight. In ‘The Wandering Who,’ I elaborated on this topic. As you may know, many of Israeli thinkers have been concerned by this topic. I would recommend watching Yoav Shamir’s film, ‘Defamation’ in order to understand the subtlety of the Israeli debate. In Western Germany, by the way, the first generation didn’t talk, the second generation was the angry one, the third generation (if not ‘right-wing revisionist’ or ‘antifa’) tries to understand. I don’t really know about the situation in Eastern Germany. Does that seem similar to your experience? G: I contend that this results from a systematic and institutional repression mechanism that verges on complete denial. I suppose that for the Germans the Holocaust chapter created cognitive dissonance that has never matured into a universal lesson. Maybe the time is ripe to look at the Holocaust as an integral part of your past and understand it within the context of an historical continuum. Such an approach may prevent the next global disaster. Clara: You might be right; what you are saying here provides a lot of food for thought. I think it is necessary to have a look at the reasons for the denial, both the wish to look only forward and the repression of the past. And of course, its place within German history. But let us explore this one step at a time and have a look at the personal experience first. In my family we grew up with fathers who didn’t talk about the war and mothers who talked about the war as if it had been a fate that had come upon them: the husband killed, the waiting for the fiancé who was a prisoner of war in the Sowjetunion, the bombs, the hunger, the tearing apart of families, the sticking together as a family, the partition of Germany and the tearing apart of families again. I learned very early that war is something terrible and this became a basic premise for me. Warmongers are wrong and it is essential to stand up against them. Gilad: I am pretty aware of that response to history and I am fully aware of German suffering. But what was the role of the Holocaust in all of that? Clara: It wasn’t really mentioned in my family. But when I was sixteen I saw the original films about concentration camps and industrially-organized murder and I was profoundly shocked. And this was not fiction! The Nazis had made these films themselves and had seemed to be proud of what they were doing. I took part in a youth exchange in Israel, I saw the names and portraits of people who had been killed and I spoke to survivors. The word ‘ramp’ has never been a normal word for me again. A ramp is a place where people were selected to live or die by doctors whose duty was to preserve human lives! This was reality. And it would not go away if I looked into another direction. So the Holocaust, too, became part of my moral compass, to prevent something like the Holocaust from happening again a kind of a mission in my life. At some stage the Holocaust did become important in your life, when was that? Gilad: Hard to say exactly. But it is clear that there was a shift in Israeli society in the 1970s. Some believe that it had something to do with the great victory in 1967. Others believe that it was actually the traumatic defeat in 73. And a few believe that it had something to do with Menachem Begin’s victory in 77. Begin was a right wing Polish Jew who was not a part of the ‘sabra’ narrative. Begin peppered his speeches with Holocaust anecdotes. In truth, the shift was probably occasioned by a combination of these factors. I grew in the midst of that cultural shift in the treatment of the Holocaust. Clara: What about guilt? Did you learn in Israel that Germans were cruel and guilty? My experience in Israel was that people didn’t blame me, personally. But the question of guilt was always in the room. Gilad: This is a fascinating topic. Zionism was and still is a nationalist, racist and expansionist ideology. It didn’t just resemble Nazi ideology, it actually predated Nazism by almost three decades (the first Zionist Congress took place in Basel in 1897). Some political elements within the Israeli right were proto-fascist (Menachem Begin’s Herut Party for instance). And it was actually the Israeli ‘Left’ that ethnically cleansed the Palestinians and prevented their return to their land through discriminatory race laws that were far too similar to the Nuremberg race Laws. The young Israeli Army pretty much copied the Blitzkrieg military doctrine, a military strategy that led to the 1967 miracle victory. So at least in its early days, the Israeli attitude to Germany and Nazism was somehow mixed. No one loved Nazis but admiration for Germans and German culture was deeply embedded in some segments of the still young Israeli society. We are dealing with a love/hate relationship. We have, once again, stumbled upon a cognitive dissonance at the heart of Israeli/Zionist culture. I can try to explain this. For Israelis in the post Holocaust years, the Shoah was a shameful event. It made Diaspora Jews look hopeless. ‘Lambs to the slaughter’ is how they were described in Israel. Young Israelis preferred not to associate themselves with that disastrous Jewish chapter. They regarded themselves as the healthy alternative. In my immediate family there was always a fascination with Germans and their culture. I even allow myself to think that my peers didn’t see Germans as enemies. Within my immediate circle the big war belonged to the past. Clara: That was also my experience with my Israeli peers during the youth exchange. Gilad: But it is also true that my right wing grandfather, a veteran terrorist who had settled in Palestine in 1936, deeply hated Germany, he vowed never to visit Germany or to own a German car. In short, the interaction among Israelis, Germans and the Holocaust is not as simple a topic as some want it to be. More interesting for me is to hear how the question of German guilt become part of your life, after all you were born almost a decade after the end of the war. Clara: It was very early. As a kid of eight I was in Tansania as a missionary’s daughter at an American boarding school. The year the Berlin Wall was built my American school-mates blamed me for being a Nazi and a communist at the same time. So yes, I learned that it was ‘the’ Germans who had been responsible, in the case of the Berlin wall in cahoots with the Russians. Mercifully I didn’t bring my parents‘ and relatives‘ guilt into the picture until later. Then I found that this was a very wide field indeed, which could hurt a lot. There was the whole range from a grandfather awarded the title ‘acknowledged antifascist’ in the former GDR, family members being silently critical of what was going on over collaboration to enthusiastic support and even committing war crimes. There were quite a lot of secrets to discover for the 2nd generation. But back to you. Obviously the Holocaust shaped your life a great deal. How was that? Gilad: I can’t really say it did. As I mentioned before it wasn’t a pillar of my identity. But I guess that it was true that the Holocaust was there to deliver us as Israelis, a clear hawkish message--we were raised to fight to death and were traumatised by phantasmic future attempts in our lives ‘as a collective’ (Arabs, anti-Semites, USSR, PLO, Iran etc.) I guess that it was this deep sense of PRE-TSD that contributed to the incredible Israeli victory in 1967. In their minds, my father and his peers were preventing a Holocaust by means of a Jewish made blitzkrieg. Gilad: PRE TSD (Pre Traumatic Stress Disorder) as opposed to POST TSD refers to the idea of one being traumatised by a future phantasmic event. I can provide many examples of PRE TSD manifestations that have shaped Jewish history and actually led to total disasters. Clara: But the danger was real. Israel was surrounded by hostile neighbours. In my teens it began to occur to me that we were living on someone else’s land. I realised that Israel was a State but Palestine was the land. While in the army and especially at the time of the 1st Lebanon War (1982), it became clear to me that we, the Israelis were on the wrong side of history. As I mentioned in a few of my writings, when I visited Ansar, and witnessed Palestinians and Lebanese locked behind barbed wire, guarded by towers and machine guns, for the first time I understood that in this battle, I was the Nazi. It was actually the internalisation of the meaning of the Holocaust that transformed me into a strong opponent of Israel and Jewish-ness. It was the Holocaust that made me a devoted supporter of Palestinian rights, resistance and the Palestinian right of return. Clara: So the Holocaust holds a universal message for you and you had to realize that it was not seen like that in Israel? Gilad: Exactly. I knew that my days in Israel were numbered. Clara: It was similar for me. 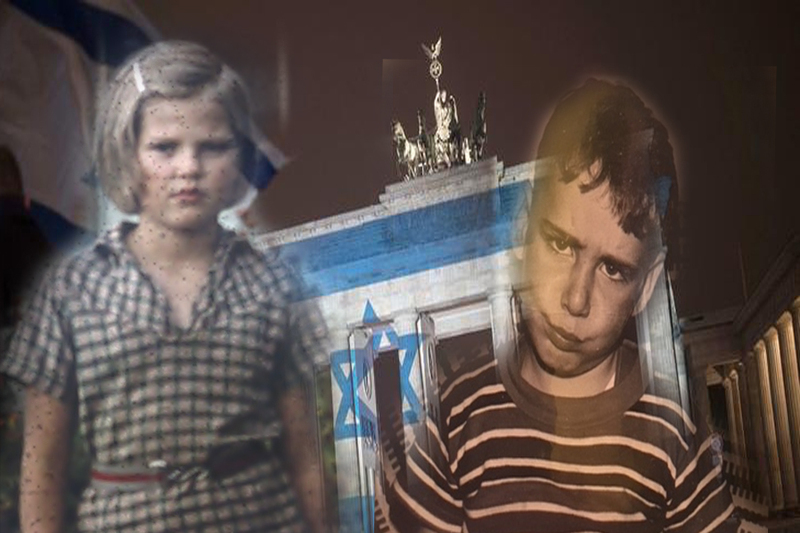 During the Israel exchange even as a 17-year-old teenager I wondered about how my German „father generation“ could be full of admiration for the Israelis who had just won the 6-days war and how no Israeli complained about applause from the wrong side. The former victims and the former perpetrators joined into the celebration of the victory together. When I asked them about the fate of the Palestinians the answer was: „The Arabs want to throw us/them into the sea”. I picked apples together with 200 young people in a Kibbutz. A great peace project. Some Arab youths from Nazareth made friends with us. I was invited to one of their homes. And strictly reprimanded by the Kibbutz people because „those Arabs are dangerous“. So that is when I learned that you cannot always call a spade a spade. There seem to be good and bad spades. This made me critical of Israel’s politics, but of course also of the American war in Vietnam and the unconditional support Germany gave to our ‘big brother’. It made me take part in the big German peace movement in the 1980s and turned me into a staunch supporter of the German ‘Entspannungspolitik’, the policy of détente in Europe, which led to the fall of the wall in 1989. And you weren’t content with being a Jazz musician in Britain. You also became a political activist. Gilad: I am really not a political activist, I have never been part of any political organisation and, in general, I stay away from activists. For one reason or another, activists always know the answers. They follow commandments, jargons, regimes of correctness. I am instead a philosopher, my task is to refine the questions. I am pretty good in opening the discourse, offering alternative perspectives. I have been subject to some intensive defamation and smear campaigns, however, it is now clear beyond doubt that my work on identity politics in general and Jewish identity politics in particular was simply ahead of its time. I may not sound modest, but I believe that even my bitterest detractors would admit by now that this has been the case. Antisemitsm- Reality or Merely Statistics?